Memory Jogger is a powerful task manager allowing an assistance in organization of tasks list and an optimization of the time. Ergonomic with the main points of a quick reference guide. – connection with Mail Application, task’s sending by electronic mail. 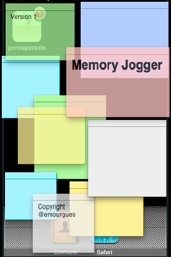 – alert notification with colorization of tasks, warning counter on Memory Jogger application’s icon. – define a task’s title (summary), a priority, an expiry date, describe the task and its status. -portrait mode or landscape mode in order to keyboard more information and to get a wider keyboard.